Life in the wilds of West Texas can definitely be exciting. With school out, the kids love going to the farm with my darling husband to help out. Well, Kid 1 is learning how to work with the module builder and helping pack the harvested cotton. But Kid 2 just goes to have fun and explore and let her imagination run amok -- all of this is important work too. Well, recently the kids got more excitement than they bargained for, and I got pretty darn close to a heart attack. While the family was out at the farm, I was visiting a friend when I got a text from a stranger that said: "I have got your kids." It turned out, he was a kind soul with the Grape Creek Volunteer Fire Department. My husband was moving the stripper (seriously, it's a cotton picking machine) from one farm to another when he managed to get tangled up in some electrical wires. The line was down and he couldn't get out until the power company came and turned off the electricity. Fortunately, the kids were riding with his farm hand and following behind. So they were safe, but had front row seats of watching their father in trouble. When I got there, they'd managed to get the DH out and we were all able to unite for a family hug. But then he had to repair the stripper and move it off the road. Since the kids were shaken and I was of no use at the scene, I decided to take the kids back home. I don't think I have ever prayed so hard or driven so fast in my life. It also left me full of gratitude and with an determination to cook. In our house, the kids help with the prep work and I figured that more than anything would help calm them down, bring back a bit of normalcy. Also, I wanted to greet my husband with a wonderful family meal. Truth be told, I wanted, needed, the comfort of the kitchen, to do something. I wanted something warm to cut the chill of this experience, so I reached for the spices I'd grown up with -- bay leaves, cinnamon, cloves, cardamom and more. I added earthy turmeric and smoky cumin. To give it substance, I threw in hearty favorites like carrots, chickpeas and meatballs. Working in the kitchen together, I saw my kids relax and listened to their thoughts and feelings. The aroma of spices melding together wrapped around us like a warm hug. Somewhere along the way, I'd stopped watching the clock and so I was pleasantly surprised when the DH walked in the door. It was the best family meal we'd ever enjoyed. Life is full of blessings, big and small. 1. Heat oil in a large pot or a dutch oven. 2. Add whole spices (cinnamon to peppercorns) and cook for about 2 minutes. 3. Add chopped onions, potatoes and carrots and cook until onions are softened. 6. Add in olives and spinach, stir, Add salt to taste. Take off heat and top with fresh cilantro and green onions. Stir before serving over rice or couscous. This post is part of Let’s Lunch (#LetsLunch), a twitter-based virtual lunch club where anyone interested can join our monthly ‘lunch date’. A topic is posted at the beginning of the month, and this motley group of food bloggers, writers and people who just love cooking from all around the world jump in and cook up a storm. Anyone can join at any time – just join us on twitter by searching and adding the hashtag #LetsLunch. Join Me on My 2015 Cooking Challenge? Plus a lentil recipe! 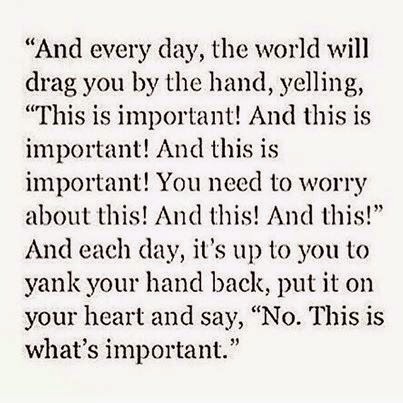 Happy First Sunday of 2015! I have had time to reflect about the past year and examine my hopes for the new one, I have my coffee and I feel ready to share my thoughts. And I have decided to combine two different cooking challenges to come up with one that's my own. The 52 NewFoods Challenge (#52NewFoods), developed by Jennifer Tyler Lee, a mother of two. She came up with the challenge in an effort to make her family eat better and include more variety. How it works: You try one new food each week for a year – or try an unfamiliar preparation of an already-known food. Each week, the family jointly chooses one new recipe and commits to preparing it together. Take a Bite Out of Your Cookbook Pile Challenge (inspired by the awesome Take a Bite Out of Your Aged TBR Romance Pile 2015 Reading Challenge). Basically, I have an entire floor-to-ceiling book shelf full of cookbooks and this is the year I'm using them! Committing to cooking together once a week is doable even for a busy family like mine. It involves the whole family, which means the work is shared and the kids are more likely to learn and hone kitchen skills. If the kids help make it, I know they’ll be more likely to taste it. So, less power struggles at the table, more fun and family time in the kitchen. We'll actually use my cookbook collection and it'll help me sort my books into keepers and giveaways. My local library loves getting cookbooks for its annual fundraising sale, your might too. We get to enjoy good, healthy home-cooked food in the end of all the work. Note: Okay, so some of the recipes we try might not be as healthy as others, but since we're making it we'll know exactly what's in it and that's healthy in itself. So are you taking on a foodie challenge (anything food related, doesn't have to be healthy or involve diets) this year? Want to join mine? And, yes, I'm returning to food blogging this year. Food -- cooking, sharing and eating of it -- is nourishing to my body and my soul. Wishing you good health and good eats in 2015! 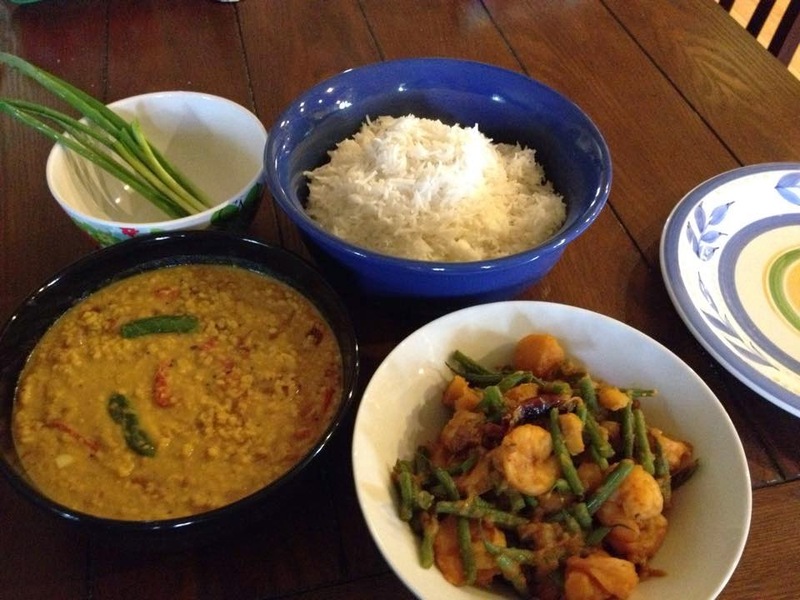 In the Bengali meal picture, many would assume the shrimp curry with pumpkin and green beans (actually I used Kabocha squash since I was out of the more traditional pumpkin) is the star. Not so. 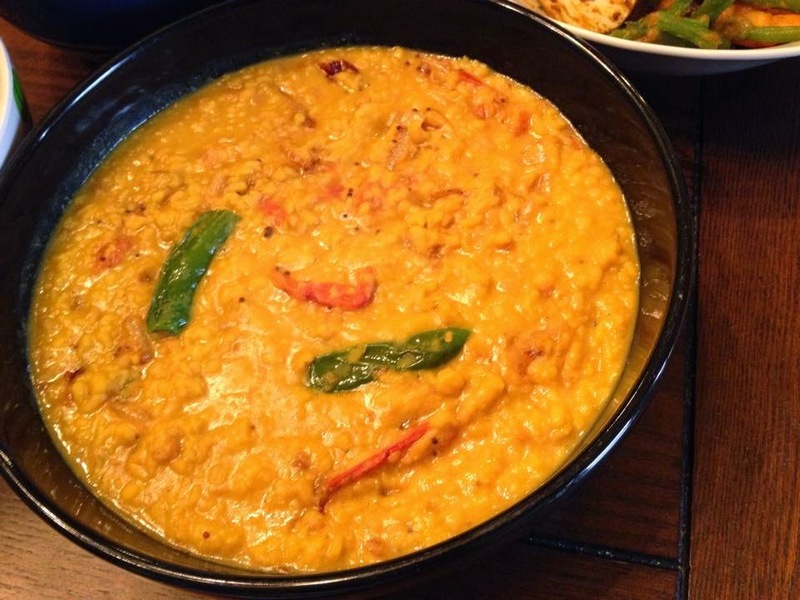 It's the dahl, golden lentils cooked with warm, colorful spices and flavorings. There's a Bengali saying: Dahl bhaat Bangali. It translates too: A true Bengali only needs dahl and rice to be happy. Since it was for the new year, I decided to cook a fancier version of the dahl instead of my usual everyday one. There as many ways of cooking lentils as there are lentils in a bag. 1. Over medium heat, dry roast the lentils in a pot (basically, fry lentils in a dry pan or pot until you get a nutty aroma and the lentils turn a shade darker). 2. Add enough water to just cover the lentils. Add in 1/3 of the onions and the spices (from turmeric to chili powder). Bring to a boil, lower heat to a gentle simmer. 3. Keep an eye on the lentils. When the water almost disappears, check the lentils. Mash them if you can, add more water to just cover and let them cook. Keep doing this until the lentils reach the consistency you want. I wanted it to be mostly creamy, but still with some shape to the lentils. When done, take it off the heat and set aside. 4. In a small frying pan, melt the butter. 5. Add the onions and cook for a few minutes. Add the mustard seeds and serrano pepper. Cook until onions are soft and browning. 6. Add the tomatoes and garlic, cook until soft. Scrape the cooked veggies and butter into the pot of cooked lentils. Add salt to taste, stir and serve with rice.